With the release of the second volume of C. F. W. Walther’s Gospel Sermons, Concordia provides yet another collection of key writings of the first president of The Lutheran Church—Missouri Synod. Walther's sermons reflect not only his importance as leading theologian of the LCMS in the first decades of its existence but also his extraordinary gifts as a preacher. Now in English, Walther’s sermons originate from nearly 30 years as pastor of the first German Evangelical Lutheran (Joint) congregation of the Unaltered Augsburg Confession in this country. 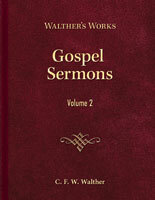 Gospel Sermons Volume 2 covers The Time of the Church (the season after Pentecost, including sermons for several feast days). Experience this explanation of God’s Word by Walther and know that Christians are, as Walther emphasized on the frontispiece of the original edition, “a chosen race, a royal priesthood, a holy nation, a people for His (God’s) own possession, that you may proclaim the excellencies of Him who called you out of darkness into His marvelous light” (1 Peter 2:9). One of the most significant Lutheran theologians in North America, Walther (1811–87) dominated the theological landscape of the mid-1800s. A leader in the Saxon immigration to Missouri in 1839, Walther helped to found the college that would become Concordia Seminary, St. Louis, Missouri, as well as to organize The Lutheran Church—Missouri Synod. In addition to serving as a pastor, Walther was the synod’s first president and the president of the seminary and its leading teacher. A prolific author, Walther wrote on a variety of topics, corresponded with numerous religious leaders, edited the theological journal Der Lutheraner, and helped start Concordia Publishing House. Donald Heck found the sermons of Walther fascinating and insightful and wanted to share the clear Law and Gospel messages with English-speakers. Son and CPH author Joel Heck reflects on his father’s passion for translating the sermons of Walther in this interview published at the release of the Gospel Sermons Volume 1.